In 1989, director Mary Lambert collaborated with King of Horror Stephen King to bring his best-selling book PET SEMATARY to the screen. UNEARTHED AND UNTOLD: THE PATH TO PET SEMATARY the shocking true story behind the film to genre fans this March. Hitting Blu-ray for the first time ever, aficionados of this undead classic can dive behind the scenes in HD glory, with a graverobber’s bounty of putrid bonus features on the film’s Blu-ray release! It's true that sometimes dead is better, but for two New England filmmakers, the story of Stephen King's PET SEMATARY was far too alluring to leave buried. That's why John Campopiano and Justin White spent nearly five years seeking to uncover the story - from book, to film, to cult status - amounting to the most comprehensive look at the horror classic ever produced. UNEARTHED AND UNTOLD: THE PATH TO PET SEMATARY is both an in-depth independent documentary and celebration of King's classic tale of terror, told through the voices of cast and crew from the 1989 hit film, as well as locals in Maine - the place where it all started. 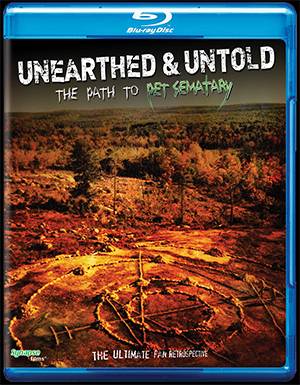 UNEARTHED AND UNTOLD: THE PATH TO PET SEMATARY is out now and is available from Synapse Films and Amazon.